Scars are a daily reminder of a wound or injury incurred in the past. It can be an embarrassment for the person with scars, if the scars happen to be on face, neck or any visible skin of the body. Often times, women wear clothing’s that can cover their scars which can put limitations on the choice of clothes that they can wear. 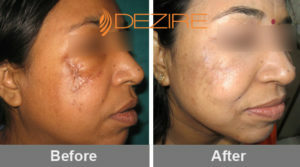 Now at Dezire clinic, Delhi we have a solution to get rid of the unsightly scars. A scar is a tissue that grows while your body heals from a wound or injury caused by accident, fall, burn, surgery. Scars vary in shape and size. They may start out red and thick and fade over time, or turn flat, sunken, or lumpy. Whenever there is an injury involving dermis (the inner, living layer of the skin), the body needs to repair it. In the process of repairing, it forms a protective scab over the wound, and it uses cells called the fibroblasts which send collagen fibers across the injured area. These collagen fibers are proteins that occur naturally in the skin, but they are much denser and closely packed in a scar. Because of the dense and thick nature of collagen the scar has its unique appearance and feel. Genetics plays an important role in scar formation. Some people are genetically predisposed to scarring, and these individuals may develop very visible scars from even very small wounds. Some people might be more resistant to scarring, although large wounds will still usually leave scars behind. The scarring is also affected by anatomical location of the wound. Some areas of the body are also more likely to experience significant scarring than others. Typically, places with high blood supply will scar less, while places with low blood supply will scar more frequently. This is one of the reasons why most people have more visible scars on their legs, arms, and hands than they do on their face. Discoloration or surface irregularities are subtle scars that do not impair function or cause physical discomfort and include acne scars as well as scars resulting from minor injury and prior surgical incisions. Hypertropic scar is formed by thick, lumpy, raised scar tissue developing directly at a wound site. They are often raised, red and/or uncomfortable and may become wider over time. They can be hyperpigmented (darker in color) or hypopigmented (lighter in color). Keloids are larger than hypertropic scars. They can be painful or itchy, and may also pucker. Keloid scars extend beyond the edges of an original wound or incision. Keloids can occur anywhere on your body, but they develop more commonly where there is little underlying fatty tissue, such as on the face, neck, ears, chest or shoulders. Contractures result in restricting movement due to skin and underlying tissue that pull together during healing. They can occur when there is a large amount of tissue loss, such as after a burn. Contractures also can form where a wound is just around a joint, restricting movement of the fingers, elbows, knees or neck. Depending upon the severity of your scarring, and the type, size and location of the scar, Dr Yadav will recommend either single technique or a combination of scar revision techniques to achieve the best results. Topical treatments, such as gels, tapes or external compression, may be used to treat existing surface scars and discoloration, and to aid in the healing of scar revision procedures. Injectable treatments may also be used. Dermal filler can be used to fill depressed or concave scars. Depending on the injectable substance used and your particular scar conditions, results may last from three months to several years. Therapy must be repeated to maintain results. Some scars require layered closure. Layered closure is often used where skin is excised to tissue below the skin surface or in areas with a high degree of movement. Some advanced techniques like of complex flap closure like W-plasty or Z-plasty techniques are used if the excision is deeper. In the initial healing phase of healing, localized swelling, discoloration or discomfort might be expected, and may take 1 to 2 weeks. The wound will continue healing for several weeks and as the new scar heals it will slowly refine and fade. The cost of laser scar removal treatment depends upon the type of treatment that is suitable for you. Please visit Dezire clinic, Delhi to find out about treatment that’s suitable for you. 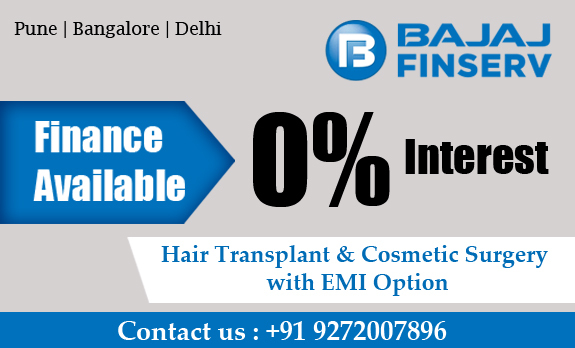 On your visit our expert staff will give you exact cost of the treatment for you.